Photo: Yinka Dene Alliance. Nadleh Whut'en Chief Martin Louie speaks outside of a 2012 Enbridge meeting of First Nations opposition to the Northern Gateway pipelines. The following excerpt is taken from one of their case studies, Northern Gateway, a proposal by Enbridge to run two pipelines from the Alberta tar sands across British Columbia and through the territories of many First Nations. Surveillance of Northern Gateway opponents involved intelligence sharing across a range of agencies in the security state. Coordinated by the RCMP, this network also included CSIS, the NEB’s [National Energy Board] security personnel, local and regional police, petroleum firms, and private security firms. Not coincidentally, the Northern Gateway policing effort was organized under the growing rubric of critical infrastructure that had been emerging as a central node in reorganizing national security bureaucracies toward domestic surveillance (see Monaghan and Walby 2017). “Critical infrastructure” is an organizational mechanism of the security state that redirects the vast resources of the “war on terror” toward a broad spectrum of domestic actors. It was used to characterize the Gateway pipelines proposal. Despite the pipeline not being an actual piece of infrastructure, the policing agencies operating under the protection of critical infrastructure share close relationships and an ideological partnership with the corporate world of extractive capitalism, as discussed at the shareholders meetings. Given these affinities, the banner of critical infrastructure has been a prominent category by which Indigenous communities that assert their rights and self-determination can be labelled as national security threats, which then allows the security state to intensify the surveillance and policing of these movements. Underlining the benefits from private-sector partners, Fadden emphasizes how agencies like CSIS and the RCMP have sought to bring corporations into an intelligence sharing “dialogue” through more formal mechanisms. Within the broadening domain of the “war on terror,” security state officials can easily evade or ignore any responsibility toward Indigenous communities. Transforming national security practices around the theme of critical infrastructure protection has cemented the position of corporations within the security state. Although critical infrastructure protection only began to be formalized after the National Strategy for Critical Infrastructure was published in 2009 (Canada 2009a, 2009b; Monaghan and Walby 2017), the organizational approach has evolved quickly due to the resources given to national security policing, as well as the benefits for private corporations. In large part, the high priority for “partnerships” with the private sector has been rationalized because over 90 percent of what is considered critical infrastructure is claimed to be owned and operated by private corporations (Canada 2009a, 2009b). Given these institutional arrangements, the corporations have become more than merely stakeholders — they are now active policing partners. The implications of the partnership are profound given the impacts on targeted social movements, or democratic practices more broadly. After all, it is in Enbridge’s best interest to ignore Indigenous law declarations since they are a corporation whose primary concern is bolstering profits. Yet, provincial and federal governments are bound by the Canadian constitution and numerous court rulings to consider the implications of contestations over lands unceded by treaty. However, within the broadening domain of the “war on terror,” security state officials can easily evade or ignore any responsibility toward Indigenous communities. Moreover, given the close relations between the security state and tar sands corporations, Indigenous communities have become increasingly surveilled and criminalized by the security state through the framing of pipeline opponents as “environmental criminal extremists.” In 2012, the federal government established an RCMP counter-terrorism unit in Alberta to “protect” the energy industry. 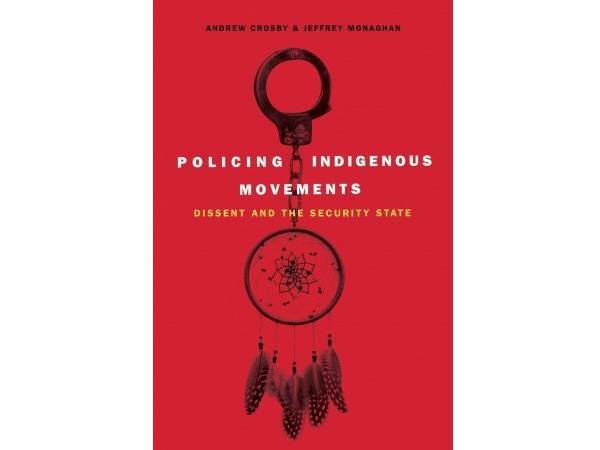 The security state focused particularly on environmental movements opposed to tar sands development that aligned themselves with Indigenous movements. For the security state, a well-organized and globally connected environmental movement working in solidarity with the decolonial praxis of Indigenous communities represented a significant threat to critical infrastructure and the development of extractive capitalism. On January 9, 2012, one day before the NEB hearings commenced, Natural Resources Minister Joe Oliver issued an open letter targeting Northern Gateway opponents. Oliver labelled Indigenous communities and environmental groups as “radical” enemies of progress acting against the “national interest” (Oliver 2012). Outlining the Harper Government’s unconditional support for energy corporations and extractive capitalism, Oliver claimed that “these groups threaten to hijack our regulatory system to achieve their radical ideological agenda” (ibid.). Glossing over the billions in tar sands foreign investment and government subsidies, Oliver proclaimed, “They use funding from foreign special interest groups to undermine Canada’s national economic interest” (ibid.). Oliver declared that long delays for major projects were no longer acceptable, thereby justifying the government’s upcoming gutting of environmental legislation (that would, in turn, help spark the Idle No More movement). This was the result of a collaborative effort emanating from energy industry interests directly linked to tar sands pipelines proposals. The framing of opponents as foreign agitators hedged against the national interest contributed to an overall narrative of pipeline opponents as serious threats to national security. Though environmental movements have a poor track record of recognizing their own settler colonial characteristics, the movements against the Northern Gateway Pipelines provided elements of the environmental movement the opportunity to place a critique of settler colonialism at the forefront of their political struggle. Although there is still much to be resolved between Indigenous and environmental movements, the solidarity between them that was evident in the early stages of the campaign against the pipeline captured the attention of security agencies who recognized the power of the coordinated opposition to the pipeline. A slide deck from Enbridge that was provided to INAC’s Deputy Minister Michael Wernick during an unofficial lobbying meeting on September 21, 2011, expresses these concerns from the vantage point of Enbridge and the government.1 Under the headline “New challenges,” one presentation details the growing threat of international funding to “green lobbyists” (INAC 2012-88: 29). Without a trace of irony from a department thoroughly embedded into the network of energy lobbyists, the presentation highlights the threat of U.S. funding and provides an itemized list of environmental and Indigenous entities who have received funds from U.S. foundations (ibid.). Moreover, a separate briefing note to the Minister of Indian Affairs outlines that “One of the main obstacles for the project is the unsettled land claims in bc” (INAC 2011-1387: 2). It concludes by warning, “Opposition to oil sands projects including the Northern Gateway has become a big fundraiser for environmental non-governmental organizations” (ibid.). With an acceleration of collaborations between the security state, Indian Affairs, and tar sands corporations, the framing of opponents as foreign agitators hedged against the national interest contributed to an overall narrative of pipeline opponents as serious threats to national security. In an email to colleagues from multiple agencies in the security state, O’Neil from the Critical Infrastructure Intelligence Team notes that “Canadian law enforcement and security intelligence community have noted a growing radicalized environmentalist faction within Canadian society who is opposed to Canada’s energy sector” (RCMP 2013-5745: 156). Using language developed in the context of the “war on terror” to describe domestic threats to national security, O’Neil claims that “environmental extremists associated to well funded NGOs have the expressed intent and demonstrated capability to engage in criminal activity to prevent and disrupt the development of the Alberta Oil Sands” (ibid.). In his assessment, O’Neil identifies “environmental extremists including Greenpeace as credible criminal threats to Canada’s energy sector” (ibid.). In a clear attempt to transplant the language of terrorism into a social context of protest and democratic dissent, O’Neil concludes, “Environmental criminal extremists have … the objective of influencing government policy, interfer[ing] within the energy regulatory process and forc[ing] the energy industry to cease operations that they assess as being harmful to the global environment” (ibid. : 157). With a deepening of the alignment between the security state and extractive corporations, threats to pipeline development allowed for an extensively broad program of surveillance. With a focus on “garnering support” from Indigenous communities, Enbridge — and the security state — recognize that the pipeline requires the theft of land or the use of unceded land in typical settler colonial fashion. Although settler colonial authorities have a long history of using legal techniques of land theft to promote development, the moral authority to carry out these practices must be managed to confer a legitimacy to this project. As articulated by the security state, a “grassroots alliance” between environmentalists and Indigenous communities might disrupt the efforts of Enbridge to “garner support.” Again demonstrating how security state agencies like the RCMP become supporters and facilitators for large tar sands corporations, specifics about the political opposition are ignored and the protests are represented as merely criminal. This tacit rationalization of pipeline development works simultaneously to disqualify legitimate land claims made by Indigenous groups (and supported by environmental groups). Unlike the summary of Enbridge claims regarding economic development and pipelines that are articulated by the security state, Indigenous claims to land, or expressions that contest the logic of settlement and development, are never mentioned. Instead, they are presented as a panoply of irrational grievances. Little has changed in the representation of Indigenous grievances from the land expropriations of the nineteenth century (see Carter 1990) and Canadian civilizing missions that required the assimilation of Indians of “good moral character” (Lawrence 2004: 30); contemporary police continue to rationalize ongoing surveillance efforts against pipeline opponents on the basis that opponents are unreasonable and are enemies of development, progress, and Canadian values.